This robust salad is filled with surprises. Toasted and crunchy crusted tofu, roasted yams, creamy macadamia nuts, and silky black rice is tossed together to create a unique burst of color and flavors. This recipe makes enough for a crowd so pull it out for that next BBQ. It is a great vegan dish to serve to those who won’t be partaking in the meat fête, but it also holds up well next to a hearty piece of fish, steak or grilled chicken. Prepare black rice according to package directions; about 45 minutes. Spread the rice evenly on a clean sheet pan to release steam and cool. Set aside. In a small bowl, heat the coconut oil in the microwave for 30 seconds to liquefy. Whisk in tamari, red pepper flakes, oyster sauce, ginger, and garlic. Set aside. Spread the diced sweet potatoes evenly on a clean sheet pan; toss with half of the coconut oil dressing. Spread the diced tofu (roughly the same size as the sweet potatoes) on another clean sheet pan; toss gently with remaining dress and a heavy handful of shredded coconut. Put the sweet potatoes in the 450 degree preheated oven. After fifteen minutes remove the sweet potatoes, toss and return to the top rack. Put the tofu on the bottom rack and cook until the sweet potatoes and tofu are golden brown; about 15-20 minutes. 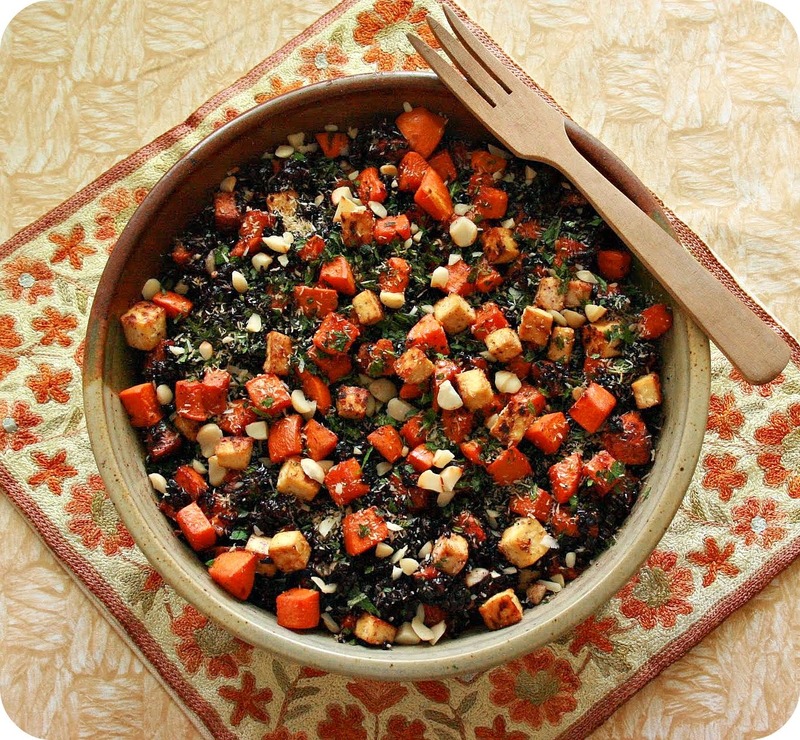 In a large serving bowl gently combine the sweet potatoes, tofu, and black rice. Add sea salt to taste (I do not recommend adding more tamari since it might overpower the other ingredients). Stir in chopped mint and cilantro. Garnish with toasted macadamia nuts and toasted shredded coconut. This salad is best served immediately while warm or at room temperature. If you are going to serve it a few hours after cooking, keep the ingredients separate until it’s ready for the table. Wow, looks delish! It's a food combination I could never imagine. What was your inspiration? My inspiration was a free day in the kitchen with a few wild ingredients to tame. It's amazing what can happen when one has a moment to breathe! OMG - this looks insanely good. I'd love to add some sriracha and devour all 10 servings with a pinot gris. YUM. You know I added sriracha to mine. so friggen good. I have that same possessive instinct, but it usually involves bread. Wow, that's a gorgeous salad. It looks amazing! Oh my! This looks amazing! I love the idea of coconut crusted tofu - brilliant! I must say, this recipe sounds delicious. I will have to expand my taste palette and try this out. Yum! Have a wonderful weekend. This is a pretty awesome dish! You really do have an eye for pairing elements together and this is a great example. Wonderful flavors as well as texture. Another winner-enjoy the weekend! Thanks for stopping by to comment today! Looks fabulous and we do go veg from time to time. This will be a perfect dish to go with a bowl of salad. This looks amazing! I've got a bag of black rice that I've been dying to make into something interesting, and this sounds like it just might be the perfect recipe I've been waiting for. :) Also, that coconut-crusted tofu sounds out of this world amazing. It really was a great combo and I loooove black rice. The coconut crusted tofu wasa revelation. What a treat! Love to hear what you think if you make this. Wow,,,I never seen one like this,all my favorite ingredients, rice,coconut and tofu mixed together,sound really tasty !! Kim this is a wonderful salad, I love it. I have some black rice but haven't used it yet, this is a great recipe and the coconut crusted tofu sounds killer. I could nibble on this all day. Just subscribed via e-mail, sorry I missed this. So many great flavors and textures in this dish. Wow I've never thought of using these ingredients together, very good recipe and sounds so tasty! I love everything in this salad most especially the tofu! Truly so healthy and delicious! I heard about the Chinese black rice story before. I love how you cooked the rice with coconut crusted tofu (YUM YUM YUM!!) and sweet potatoes (my favorite)!! I wasn't sure about black rice before but now your dish got my full attention. Looks beautiful, too!!! I love all the flavors you have in this salad. Looks delicious and your photos are beautiful! A great recipe to make for my daughter who seams to be allergic to so many proteins. I'm always looking for good tofu recipes. Thanks! Love the coconut crusted tofu...cool spin. And I always dig black rice and oyster sauce. WOW! I love forbidden rice, but only have one recipe for it currently! I can't wait to try this one though!